Koomori: Let's just get it over with here. Ataru: Get it over with here...? Ataru: How understanding you are! My babe! The wacky cast of Rumiko Takahashi's Urusei Yatsura returns for another collection of bizarre adventures in volume number eight of the TV series. Even after the number of episodes to date, the series manages to come up with a fresh spin on familiar storylines. The first misadventure involves a certain Count Dracula (Kenta Kimotsuki) and his trusty winged sidekick, Koomori (Toshiko Oota). In his routine quest for a pint of virginal blood, the Count falls head over heals for Lum. Of course, young Mr. Moroboshi will unwittingly foul things up, when he discovers that his Oni guests have an aversion to the smell of garlic and blasts the stalking vampire by accident. After a few more similar incidents, it is left up to Koomori (which means "bat" in Japanese) to rectify the food situation by enlisting Ataru's help, since he is the ultimate ladies' man (shows how much a bat knows). However, in return for Ataru delivering a female specimen, Koomori has to reciprocate, and does so by transforming into a girl. As we all know Ataru's response to any woman other than his wife, this sets up another zany episode, especially when Ran, Lum's secret enemy, shows up! Learn 'em when they're young, or so the philosophy goes, as Lum decides to go back in time to train a young Ataru in the proper way to respect a lady. She comes up with an ingenious "auto-shocker" that delivers her electrifying zap whenever the boy approaches another girl. Little does she expect Ataru to follow suit and mess up her plans. Look for a nod to Japanese special effects icon Eiji Tsuburaya's Ultraman series in this episode. Next, everything's coming up...gardenias? Ten falls hopelessly in love with a flower vendor, but when Ataru spies the young woman, he sets his own lurid designs on her. The two boys enlist Lum's help to grow a perfect gardenia, which—surprise, surprise—backfires. So much for flower power. Finally, what fans have been waiting for, the shower scene! Um... this time out, Ataru isn't going to let a little rain spoil his chances at scoring. When a mysterious young girl with—literally—a cloud on her shoulder shows up, Ataru tries to make the best of the situation. Is there nothing that will dampen this boy's enthusiasm? This series continues to have it where it counts: great characters, interesting storylines, a warped sense of humor, and solid continuity. If the show wasn't funny enough on its own, with the background provided by the included liner notes, many of the clever language uses add another layer of comedy that would otherwise go missed by English audiences. The voice acting also fits the style of the animation perfectly, and the ensemble cast allows for members to come and go at will, which enhances the diversity of the situations the main characters find themselves in. 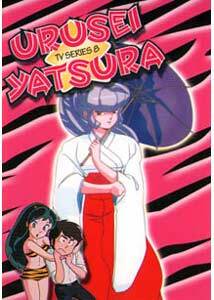 Urusei Yatsura continues to be a favorite in this otaku's collection. Image Transfer Review: This looks pretty good for a show from 1982, and I'm uncertain how realistic it would be to expect much more. Colors are strong, black levels solid, and print defects are pretty scarce and minor. Compression issues are limited to regions of dark blues or solid reds. Like the last disc, this one has one major flaw in the video, which is a persistent ghosting throughout. The credits are the worst offenders with it being more pronounced, while the effect is more subtle within the episodes. They also have the worst compression problems in areas of dot crawl or bleeding. Audio Transfer Review: Mono Japanese audio is solid, with a minor bit of hiss, and the odd bit of edginess on the dialogue. On par with the rest of the series so far. Extras Review: The main menu allows direct access to the start of each of the four episodes. The liner notes comprise a sheet and a quarter this time, and among other things, explains the pun created in the new eye catch that I mentioned in the last review. While still not as fun as the original, at least it makes more sense now. The back cover has a bio for Oyuki, who only appeared in Ep. 8, Story 15: Neptune is Beyond My Closet. Disc Eight brings another four episodes of this classic anime TV series to DVD. Urusei Yatsura was the blueprint for the situation comedy, and both the situations and the comedy are in top form here. This is one series I can never get enough of.